His courtside seats at the Jack Breslin Student Event Center await. Just take a season off and hang where everybody knows and loves him. Hey, look at that black monkey inappropriately fondling that white kid. Who does he think he is, Joe Biden? It’s funny if you watch during the game at commercial breaks how many Duke fans were coming up to him for pictures. 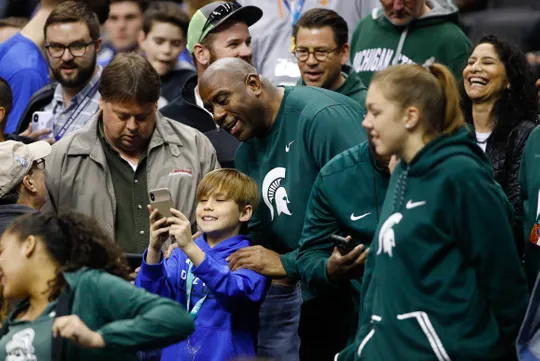 The Big Ten network did a piece on the fact he’s so popular at tourney games and fans take up this portion of his time but he refuses to watch from a box, he enjoys being with the fans. That is intoxicating, I know from my own experience as a fake up and coming baseball prospect, the fan adulation is an incredible rush.